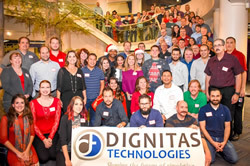 Dignitas Technologies, LLC is a certified Woman Owned Small Business, developing software engineering applications to train the Warfighter. Dignitas provides advanced technology modeling and simulating of the equipment, environments and behaviors of opposing and friendly forces, ensuring our soldiers are equipped with immersive training prior to being deployed. Read the Dignitas Technologies SBDC success story here. Invite your Member of Congress now!